To close the year out, we would like to include on our congregational blog President Obama's rather remarkable address to the Biennial of the Union of Reform Judaism, of which Adas Emuno is a member. And with that, we wish to note that including the remarks made by the President of the United States to our leading Jewish organization reproduced here does not constitute a political endorsement. And we wish you all a very happy, and safe, civil and secular New Year's Eve! See you in 2012! On Friday evening, December 23rd, Congregation Adas Emuno hosted the Leonia community menorah lighting in celebration of Hanukkah, prior to our weekly Friday evening Shabbat service. Here is a video report on that event, featuring Rabbi Barry Schwartz, Student Cantor Luke Hawley on guitar, Leonia Mayor Mary Heveran, and the children and congregants of Adas Emuno, and the Leonia community. And what better way than this to bid a sad and yet joyous farewell, and l'hitraot to our Hanukkah holiday. 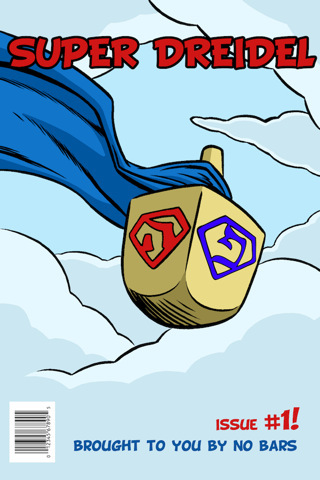 Until next year, keep the spirit of the Maccabees alive! 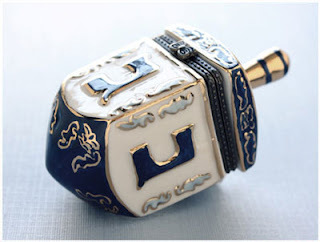 Some years we can't help but remark that Hanukkah is coming early, even though Hanukkah always begins at the same time each year, the 25th of Kislev on the Hebrew calendar. This year, Hanukkah seems to be very much in sync with the secular calendar, but that didn't stop the White House from celebrating the holiday early, almost two weeks early, in fact. The reception had a buffet of Jewish holiday specialties--as well as sushi rolls, which were also served last year. The kitchen was Koshered for the event, and the menu was prepared under the strict rabbinical supervision of Rabbi Levi Shemtov, Lubavitch Center of Washington (Chabad), in cooperation with the Rabbinical Council of Greater Washington, according to the White House. The Meat was Glatt Kosher - Chassidishe Shechitah. All baked goods were Pas Yisroel; all wines were Mevushal. The foods were prepared Lemihadrin with a Mashgiach Temidi. "An assortment of homemade desserts"
This is taken from a post entitled, President Obama Hosts 2011 White House Hanukkah Reception - The Menu, The Guest List, so go check it out if you are so inclined (the blog also features numerous White House recipes). 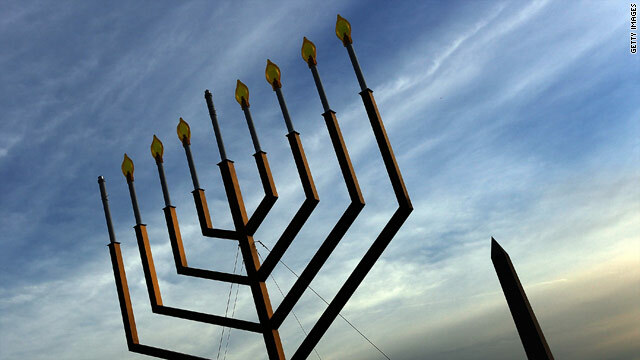 This Hanukkah season we remember the powerful story of a band of believers who rose up and freed their people, only to discover that the oil left in their desecrated temple -- which should have been enough for only one night -- ended up lasting for eight. It's a timeless story of right over might and faith over doubt -- one that has given hope to Jewish people everywhere for over 2,000 years. 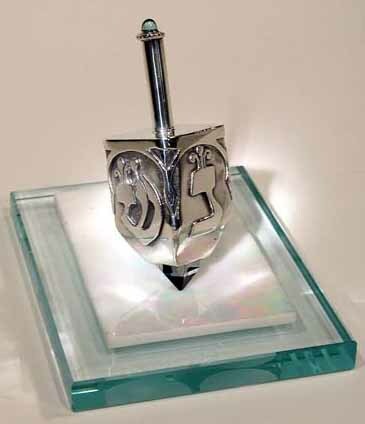 And tonight, as families and friends come together to light the menorah, it is a story that reminds us to count our blessings, to honor the sacrifices of our ancestors, and to believe that through faith and determination, we can work together to build a brighter, better world for generations to come. 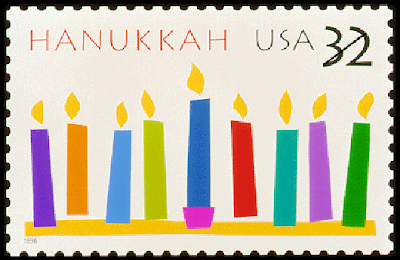 The American celebration of Hanukkah is indeed a celebration of freedom, of how a small band of rebels defeated the forces of a mighty empire and secured the independence of a nation, and the right to practice their own religion free from persecution or interference. 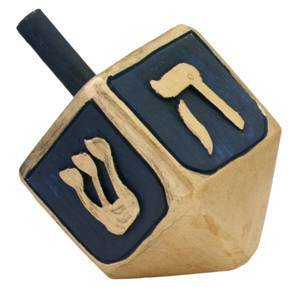 And have you ever heard anything like this electronica version of the dreidel song? And have you ever heard the new lyrics added to the song, here performed in a traditional manner? And can you imagine dreidels on Broadway? Don't let the light go out! It's lasted for so many years! This is why we will not fail! Let it shine through our love and our tears! Given Judaism's long history of Talmudic scholarship, it should come as no surprise that the idea of a "Festival of Lights" may become subject to a bit of interpretation. L'Chaim! So let your light shine, let it shine on and on, on this festival of lights! Happy Hanukkah! Well, okay, Hanukkah is the Festival of Lights, sure, but the candles we light symbolize and substitute for the oil that was burned in the Temple, which was a special type of sacred, purified and sanctified olive oil, the same olive oil we use to cook various foods, including potato pancakes, otherwise known as latkes. The word leviva, the Hebrew name for latke, has its origins in the Book of Samuel's description of the story of Amnon and Tamar. Some interpreters have noted that the homonym levav means "heart," and the verbal form of l-v-v occurs in the Song of Songs as well. Latkes need not necessarily be made from potatoes. Prior to the introduction of the potato to the Old World, latkes were, and in some places still are, made from a variety of other vegetables, cheeses, legumes, or starches, depending on the available local ingredients and foodways of the various places where Jews lived. I'm sitting in this blender turning brown. And the cook is scouting oil in the town. I can't be eaten looking as I do. Or I'll really end up in a royal stew. Wondering what I'm supposed to do. And gefilte fish no holiday's without. With no jobs, no clothes and very little food. We must help them, we must be the ones to feed. And with that, we hope you've liked our virtual latkes. Now go and enjoy some real latkes of your own! B'tayavon! And don't forget to join us this evening, at 7 PM, for the Leonia Community Menorah Lighting outside of our shul, followed by our Shabbat service, and a Hanukkah party of an oneg! With, you guessed it, lots and lots of latkes! Ma'Oz Tzur, or as it is translated into English, Rock of Ages, is the classic Hanukkah song, or perhaps more rightly, the Hanukkah hymn. So in celebration of the Festival of Lights, let's sample some renditions of this timeless classic. And one thing we can say for sure is, Hanukkah Rocks! Am I hearing you? Am I seeing you? And do you remember the Maccabeats' 2010 Chanukah music video, Candlelight? If you missed it, you can find it on this blog too, it was posted here last December, and here's the link: Feeling the Maccabeats. Go check it out, and enjoy!